I think we would probably all agree that nothing beats a personal touch. A smile, a handshake, a hug and face-to-face conversation reach people. But, when the Rev. Ted Rollins was appointed pastor of Suwanee Worship Center (then called Suwanee Parish UMC) in Suwanee, Georgia, in 2012, he knew he would have to use every tool in the tool belt to save the church! 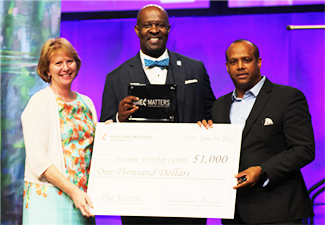 Because of his work and the growth of the church in number and ministry, the North Georgia Annual Conference selected Suwanee Worship Center as the recipient of the One Matters Award. The church’s location in an industrial park afforded almost zero visibility. No one was going to just happen to drive by and see it. He knew if people were going to come, he and the congregation would have to go get them and lead them in. Rollins was greeted by about 20 people, no sound system, no musicians and no money on his first Sunday. The church’s bank account was just about wiped out. The church’s location in an industrial park afforded almost zero visibility. No one was going to just happen to drive by and see it. He knew if people were going to come, he and the congregation would have to go get them and lead them in. Rollins went to work. He recruited some musicians. He started an extensive promotional campaign on social media. He got out, met and talked to people. The next Sunday about 40 people attended. They felt the energy at the church in spirited worship, small group gatherings, intentional discipleship, and family and youth ministries. Members invited friends and family and the church grew. Today they average about 300 in the worship services. Rollins didn’t intentionally set out to grow an African-American congregation, but as he looked around and took stock of the ministry needs in the area, he realized the African-American market was underserved. He crafted his messages and ministries to address the unique needs of that community. By getting outside the building and meeting the needs and addressing the desires of the people in his community, Rollins fed the hunger people had for something relevant and real. Showing people how to build relationships with God and with each other led to success.